Middle Eastern world has a totally different taste for desserts than the usual western menu for desserts. In case you didn't have the chance to visit a middle eastern country then we will help you explore the world of traditional middle eastern desserts and how they are made. The first thing you need to know about eastern desserts is that they are much heavier and more sugary in content than western ones, especially with the use of traditional sugary amber-hued syrup called (Sharbat). Sharbat is the most common component of any eastern dessert and it is usually made of sugar, water, and honey. The ingredients are heated or even boiled to some extent and then left to cool down. The end stage is soaking almost any kind of eastern dessert with it to give the sweet taste. Not all types of eastern desserts are soaked in Sharbat for sure but it is the most common sweetener in eastern desserts menu. Qatayef is hemispherical in shape and it is formed of special round shaped baked Qatayef paste. The circular paste is semi baked to allow later filling with nuts, dried grapes, and grated coconut. After filling, the Qatayef is now closed one side over another to give the final shape and then baked again to allow hardening. When the baking is finished, the baked Qatayef will be soaked in Sharbat for some time then it is left to cool down to be served later as a dessert. Younger generations call it the baby hair, it looks like baby hair indeed. Kunafah is made of special hairy shaped semi-baked paste. The Kunafah hair is spread over a heat stable tray as the first layer, the second layer would be formed of any filler of your choice like sweet cheese, nuts, yogurt, or any other filler of your choice, and the third layer comes on top as Kunafah again. The whole tray would be put in oven at high temperature for around 30-45 minutes. Finally, Kunafah would be taken out and left to cool down where it would be soaked with Sharbat syrup and served. Due to the high popularity of Kunafah in eastern countries, there have been a lot of trials and variations to mix Kunafah with other western desserts and Egyptians almost tried filling it with anything. 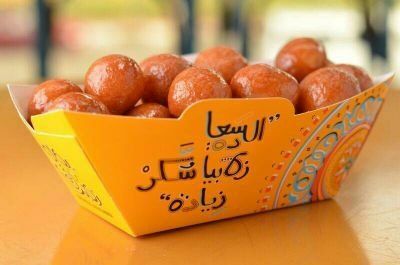 Mango filled Kunafah is also a very popular variant of the traditional Kunafah especially in Egyptian pastry shops. This one is my favourite, the exact translation of the name is Syrian Dates. Again a special Balah El-Sham baste is semi baked and left to cool down then it would be soaked in Sharbat as a sweetener. The final form would be a crispy outer later with inner mushy filler which is extremely delicious. A special powder of Basbosa is mixed with water to give Basbosa paste. Baked for around 1 hour in oven then took out to cool down. Sharbat is added as a sweetener with nuts and grated coconut on top of Basbosa tray to be served out. Not to be missed with Balah El-Sham, Zeynab's fingers are made of heavier paste and usually more crispy than Balah El-Sham. Smaller in size and guess what? Also soaked in Sharbat. Delicious pastry made out of cigar shaped rolls filled with brown sugar, cinnamon, and crushed nuts. The final ingredient is baked and soaked with Sharbat as usual with the addition of grated pistachio and coconut. Baklawa could be made also in layered trays or in circular shapes instead of rolls. Multi layered pastry made of thin baked layers with inside filling of your choice of nuts, grated coconut, or even yogurt. The final step is soaking with Sharbat with outer layer of grated coconut and nuts. The exact translation is (mother of Ali) and nobody knows the origins of the name but could refer back to Fatimite era of Egyptian history (1000 years ago). Om Ali is made of multi layered pastry soaked with sweetened milk and baked in over some time. It could be served then either in hot or cold forms, I prefer the hot one myself. Mashed date paste is outlined with Ma'mol paste and baked out to harden the outer layer and is served as it is. Extremely delicious and healthy. Zalabya is baked as small balls of paste then left to cool down. It could be sweetened either by using Sharbat or chocolate syrup to give the delicious taste. Very popular and tasty that some branded restaurants only serve out Zalabya. Eastern desserts are very delicious and also very sugary, if you try them for the first time you might find them hard to digest and you would feel full after some bites. However, they give a whole different experience than the usual western desserts and they are also easier to bake. The best nutritional value comes from using a lot of nuts and milk products which is very healthy and nutritional.